This mossy stone is in front of my Mom and Dad's house in Missouri. It looks like there's hidden treasure underneath it. And why is he the only guy growing moss? I have a corned beef brisket simmering away in my slow cooker as I am writing this blog post. Why corned beef? The short answer is that brisket was on sale at Whole Foods. Yes, it is the week of St. Patrick’s Day, which often means little more than wearing green to avoid being pinched, and possibly going to a pub after work for a pint and a plate of corned beef and cabbage. Have a wonderful holiday if you have religious or cultural ties to the holiday! I know it’s the day St. Patrick died and I know he’s responsible for bringing Christianity to Ireland, and I know that he used the shamrock to teach about the Holy Trinity. But why corned beef?! And how did the Irish get all the luck? A friend, whom I can't remember, posted this from their India trip. Yes and yes! I love a good food superstition. I love a tradition that brings good fortune and luck. And I love my slow cooker. I was in need of some good news today, so I put all of my positive energy and hopeful expectation into the pot and decided to ‘corn’ my brisket. Since I’m not really ‘cooking’ at all, (but will be rewarded with a delicious meal), I have the time to look up the answer to my question. So corned beef has nothing to do with corn, as you might’ve guessed. The term “corned” comes from putting meat in a large crock and covering it with large rock-salt kernels of salt that were referred to as “corns” of salt. This preserved the meat. The term corned comes from an Old Germanic word kurnam which meant small seed. Since a kernel of rock salt looked like a wheat or oat kernel it became known as a corn of salt. As it turns out, Ireland was the biggest exporter of corned beef until 1825. It was packaged mostly in cans and shipped all over the world. And now the luck: during the gold and silver rush years, 1850s-1900s, many of the successful miners were of Irish decent. Through the years, the Irish were known for their mining fortunes and the expression Luck Of The Irish was born. Because I must go even deeper into the history of words…the word luck is really Dutch in origin. The word comes from ‘luc,’ a shortening of ‘gheluc,’ meaning “happiness, good fortune.” The word was possibly introduced into the English language in the 15th century as a gambling term. Aha! So my corned beef is out of the slow cooker, and I got the call with my very good news! Perhaps corned beef and cabbage brought me luck after all! Good luck or not, I think today was more a lesson of doing tasks with good intentions in mind. I didn’t have to break out the crock pot to make some lucky beef dish to get closer to my goals or wishes. But the metaphor of taking a big pot and filling it with positive energy and hopeful expectation as actual ingredients, can be applied to everything I do. Make every task a vessel for goodness. Maybe it sounds ‘corny’ - ha! - but many times I go through the motions of life and don’t intend anything. I just go, and do, and everything usually ends up okay. But if I approach things intending for them to go well and with the expectation of success, at least I’m on my own side, rooting for myself, ya know? It’s a very small thing that takes very little time or effort. My life is worth that. Yours is too! Gheluc (which I imagine sounds something like guh luck, which obviously sounds like good luck) to us all! Apparently, corned beef & cabbage is purely an American tradition. Colcannon (boiled new potatoes mixed with boiled white cabbage, boiled leeks or boiled onions to which is added butter, milk, and wild garlic) is more likely to be considered Ireland's national dish. But I’m American, so I’m making cabbage with my corned beef. (But I’m an American who just got back from India, so I put cumin and turmeric in mine!) 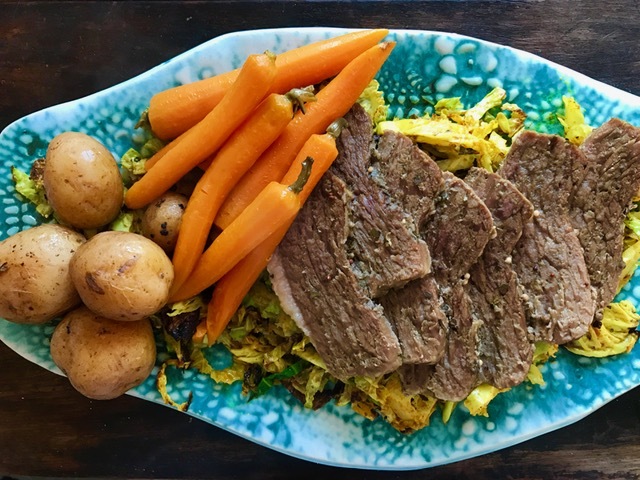 The meat and vegetables cook and taste very simple, the spiced cabbage adds a different dimension to the dish. I opened a 3-pound Corned Beef brisket (I did not brine mine) that came brined with pickling spice. I dumped it all in the pot of my slow cooker with 4 cups water, fat side down. I cooked on low for 4 hours, turning after 2 hours. I added small potatoes and peeled carrots, black pepper, and cooked on low for another 2 hours. The meat was tender and the veggies were soft, but not mushy. In a large skillet, heat the coconut oil over medium heat. Add the turmeric and cumin, stirring so they don’t burn, but ‘bloom’ in the oil - this just means they will cook and taste less dusty and raw. Their fragrance and flavors are released into the oil. Add the cabbage, stirring to coat with the spiced oil. Season with salt and pepper. Cook for 5-7 minutes on low heat, drizzle with olive oil, stir again, and cook for another 5-7 minutes until the cabbage is soft, and a little bit charred. Season generously with salt and pepper.